Many Christians today have never heard of Dr. Carl McIntire, but back in the 1960s he hosted the most widely syndicated independent religious radio program in the country. It was called “The Twentieth Century Reformation Hour,” and the thrust of its message was that there needed to be a new reformation, with churches that are true to historic Christianity withdrawing from the mainline denominations because of their tolerance of “liberal” false teachers. Dr. McIntire was the pastor of the Bible Presbyterian Church of Collingswood, New Jersey, but his voice was heard regularly by millions who never darkened the doors of his local church. His broadcast was carried by more than 600 stations at the peak of its influence, which is roughly the same as the number of stations that carry Rush Limbaugh today! It was a daily (weekdays) half-hour program put on the air by thousands of contributors stirred by its message. Those who heard Dr. McIntire knew that his no-nonsense talk show (only he did the talking—there were no phone calls taken) focused on many more topics than heresy in the churches. He was known as a “right-wing” political voice, and was targeted by several administrations for special persecution by the F.C.C. for his conservative influence. Eventually government pressure put McIntire off the air. To say that he was controversial would be to understate the situation tremendously. He named names and accused both religious and political leaders of socialist views, softness on communism, treasonous activities, and antagonism to the true Christian faith. Many were converted to the rising conservative movement in American politics through Dr. McIntire’s influence, as well as to fundamentalist Christianity. No one can deny that his influence was felt in the ‘60s and ‘70s, although whether his influence was for good or for ill is an issue that has been debated hotly. Both liberal and conservative churchmen found McIntire’s message and methods disturbing. The “new evangelical” element rising in the conservative churches joined the liberal leaders of the mainline churches in denouncing, castigating, and even ridiculing him. But now, with the passage of time, we can get a better perspective on the man and on what he was telling us, and he doesn’t look as crazy as he did to some back in his heyday. Carl McIntire died in his nineties, in 2002. It really wasn’t until after his death that a few evangelical spokesmen acknowledged the accuracy of some of his seemingly radical opinions. This is particularly true of the charge he made repeatedly that clerics of Soviet-bloc churches that had been welcomed into the World Council of Churches were actually KGB agents. Communist influence in the church councils was a regular theme of his radio addresses, but his direct charge against the Russian Orthodox and other Soviet churchmen seemed to be based on information he received from his contact with the persecuted “underground” churches behind the Iron Curtain. These claims were mocked by liberal media and liberal clergy alike, and disregarded even by conservative writers both religious and political. But it turns out he was right. Intelligence released after the collapse of the Soviet Union confirms that the clerics in question were indeed Red agents. 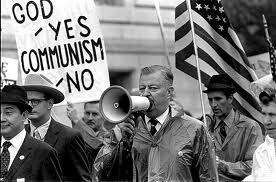 Many Christians who agreed with McIntire’s Christian fundamentalism did not agree with his strong emphasis on the radio and in public addresses on the danger of Communism and on predominantly political issues. I was one of those who wished he would focus more on preaching the Gospel and on the exposition of the Bible. 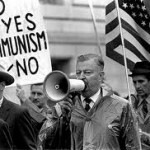 Carl McIntire was skilled in Biblical exposition and was effective in evangelistic preaching, but so often his subjects were the Red menace and the evils of the liberal trend in the government. Why was he doing this? It may well be true that McIntire’s approach was imbalanced in some ways, but it is more and more clear that he saw something many of us missed about the connection between doctrinal heresy and political error. The relation between one’s perception of eternal truth and his civil and political viewpoint is taught in the Bible and especially clarified in the interrogation of Jesus Christ by Pontius Pilate. This conversation is recorded in the book of John, chapter 18, verse 28, through chapter 19, and verse 16. The governor was supposedly seeking to determine if the Nazarene were guilty of treason. “Art thou a king then?” he asked and pressed for an answer. “My kingdom is not of this world,” replied the Son of God. “Thou sayest that I am a king. To this end was I born, and for this cause came I into the world, that I should bear witness unto the truth.” The governor responded with a telling comment in the form of a question, “What is truth?” The governor did not believe in absolute truth. Like many leading our world today, this politician lived by the assumption that all matters of principle are really matters of opinion, and that one opinion is as good as another. No principles, political or moral, are set in stone. No God above determines the difference between right and wrong. A political decision will be made on the basis of its probable effect, and not based on absolutes. Pilate’s politics were determined by his spiritual bankruptcy. What he did in the case of Jesus of Nazareth reveals how his actions as governor were affected by his attitude toward truth. The man who denied the existence of truth found a man innocent of any crime, but then had him scourged and eventually crucified. He did not have the moral fortitude to do anything else. Men in authority have always become benefactors or oppressors based upon their attitude toward eternal truth. This is repeatedly taught in the Bible book of Proverbs. Our understanding of the times will improve as we factor in the principle that theological bias is behind political ideology. And it is. Socialism arose as a philosophy to oppose the Gospel assertion that man is innately sinful. As the great revivals spread the truth of man’s depravity, those who rejected it and the salvation offered by God on the basis of it, developed explanations of where evil originates if it does not “proceed” (as Jesus taught) “out of the heart of men” (Mark 7:21-23). Socialism and the various forms of communism insisted that evil came from our economic system. Replace the competition-based system mankind has always used with a system based on cooperation, and evil will disappear. Utopia will be created. The politics of the left is based on theological heresy. Psychology and evolution also arose to oppose the teachings of the Gospel. Every political “ism” that believes that society can save itself is really a false Gospel. Rejection of God as the Lawgiver is behind the gay-marriage and abortion-rights movements in the political field. The “social issues” debated in every political campaign today are really religious issues. Traditional Christians find themselves under more and more pressure from the government, not by the accident of changing social mores, but because of specific and deliberate opposition to what they believe by those who are gaining political power. Many who are seizing power in the country hate the God of the Bible and the laws by which He says we must live. They are not neutral to Bible Christianity; some of them are sworn to destroy it. Christian doctrine cannot be divorced from politics, if both of them are understood correctly. The theological apostasy of the churches had everything to do with the political shift in America from the protection of individual freedom to the total collectivism we can all see coming. Dr. McIntire recognized and exposed the role liberal churches and church councils were having in socializing the country, but his taking the Bible to the heart of American politics was for deeper reasons than labeling the culprits that were taking us down the road to tyranny. It happened because the perversion of our politics comes from our departure from the Christian faith. When the churches failed to be guardians of the truth, the whole of our society was affected. To understand this fact is to discover another compelling reason for God’s people to speak the complete truth about what God has said and how it applies to all areas of life today. Caution about getting too political or offending people with our old-fashioned morals, or standing up on controversial issues may not be as wise as we once thought. Dr. McIntire was called a kook, but he may well have been right in ways that we must note in our day. Christians are largely derelict in their role as salt and light today, and must face that fact, confess their sin, and step up to the plate. The response of men to the truth of God ultimately determines the nature of their politics. Christians have the duty to say something about that.